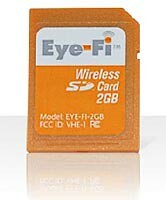 Eye-Fi Wireless SD Card: $100 and Worth It. Announced in October, these WiFi enabled SD cards allow you (and me!) to upload photos from camera to Flikr, facebook, iPhoto, Snapfish and the like without having to plug in your USB cable and sit (im)patiently and wait. According to the website, users select from among 17 popular online photo sharing, social networking or blogging sites to share their photographs, and select where on their PC or Mac they want to archive their images. Once the set-up is complete, users can focus on taking pictures and sharing memories – and not on the process of uploading photos from their camera. Eye-Fi’s free upload service allows users to transfer an unlimited number of photos. It handles full-resolution JPEG pictures and intelligently resizes the images if required by the selected online destination.